They weren’t at all rare. It happened all the time. So… what were all these women doing in Sacramento, California, that took them into the courts — and got them into the newspapers of the day? They were taking on the legal status of sole traders. 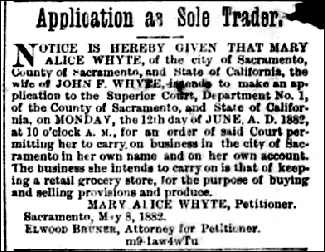 Want to know more about these women, and particularly the women sole traders of Sacramento County? The folks who’ll be hosting me this weekend at their Spring Seminar — the Root Cellar Sacramento Genealogical Society wrote the book on that: The Women Proprietors or Sole Traders, Sacramento, CA, 1850-1930 is an alphabetical guide listing the women’s names and their husbands’ names and business. And you can order it online. Pretty good deal for the women of that time period, not many states give those kind of rights to the wife. Now, she had to apply for it, where the man just received those rights because of his gender, still bias as heck but better than say Texas at the time. Crazy to see how much progress we’ve made in the changing times!